The backstory is probably not important to gamers since most people just like immersing themselves into battling the various levels of challenges. The movie versions of a film based on a game begs to have a coherent story to tie together the game's action sequences. 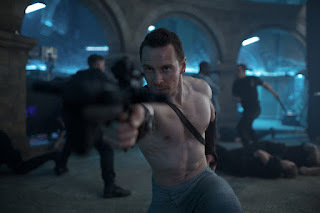 This new film based on the Ubisoft game of the same name, is directed by Justin Kurzel and written by Michael Lesslie, Adam Cooper and Bill Collage that follows an original concept in the Assassin's Creed universe. One would think from the intriguing teasers and trailers and with the high caliber actors involved that there would be something more there. Michael Fassbender who also produced the film, stars as Callum Lynch in the present and his ancestor, Aquilar de Nerha in 1492. As a child Callum discovered his father had killed his mother, so he grows up drifting in and out of trouble until he is sentenced to death for murder. He wakes up after his lethal injection to find him self at a research institution in Spain called Abstegrgo. Dr. Spohia Rikken (Marion Cotillard) tells him that she is trying to eliminate violence in the world. All he has to do is be hooked up to the Animus machine that ties your consciousness to an ancient ancestor to help them find the Apple of Eden. The Apple of Eden supposedly will end free will and this end will end violence. What they don't tell him right away is that the Knights of the Templar who have been chasing this artifact throughout the centuries wanting to control the Apple of Eden and have everyone live under the rule of the Templar. They have been stymied by the Assassin's Creed who "live in the dark to protect the light". In other words, they protect free will. The head of the Templar, Ellen Kaye (Charlotte Rampling) is going to pull the funding for Dr. Rikken's project, so Alan Rikken (Jeremy Irons) Sofia's dad and boss, forces Cal's regressions despite his daughter's warnings. The whole Apple of Eden thing is a bunch of hooey, so don't think so hard on it. They best parts are the visuals and actions sequences. During Cal's regressions as Aguliar, he runs around with his Assassin team doing lots of fighting, impossible parkour, and flashy stunts. Running around medieval cities, with a bunch of tough hombres who have wrist knives, shoe knives, smoke bombs, swords and ninja fighting skills is fun and maybe worth seeing. The rest of the film falls into a big muddled mess towards the end. If the year 1492 doesn't give you a clue, Christoper Columbus in involved.